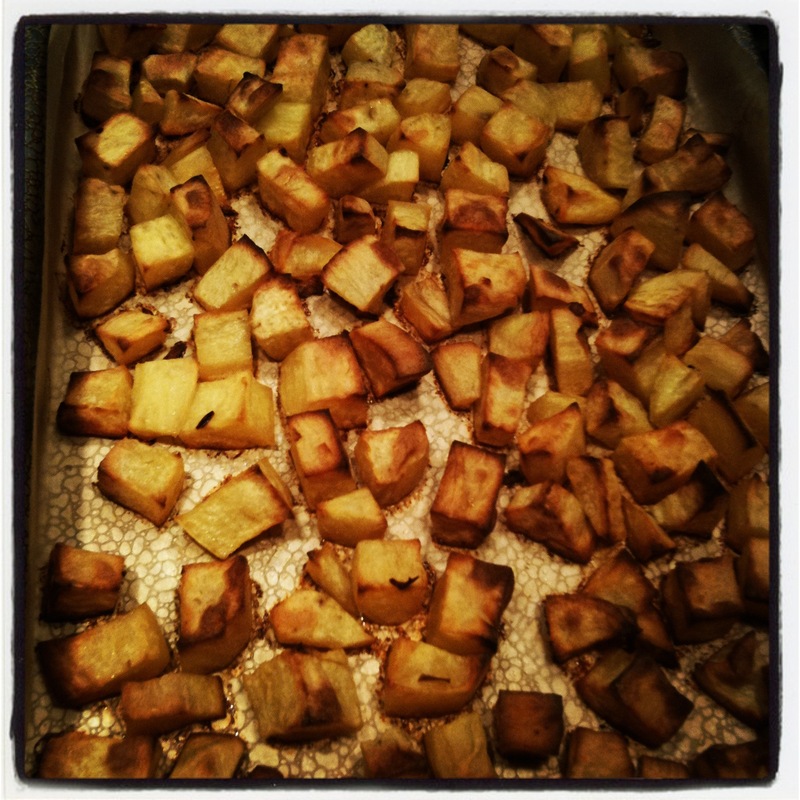 Here is the suped up version of my Roasted Winter Squash with a Twist. In this version I use Jewel and/or Garnet Yams and/or Sweet Potatoes and mix in Butternut Squash and/or Acorn Squash (whatever is available). 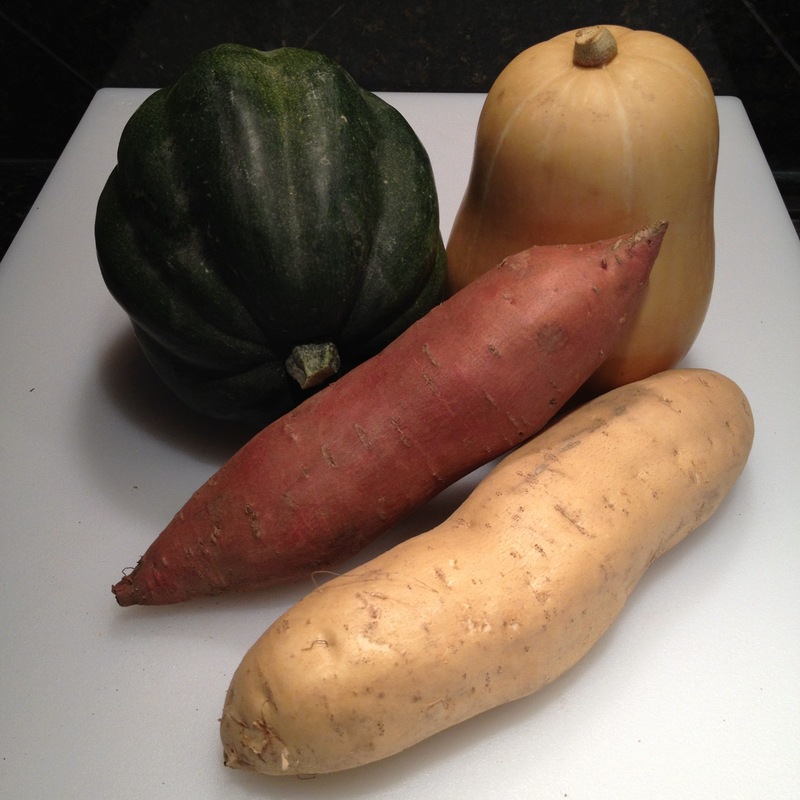 Although, did you know, that the “Yams” we consume in North America are actually Sweet Potatoes? To get true Yams, apparently requires some effort, one must source them from a market that specializes in Tropical produce. This link: Sweet Potatoes & Yams gives the breakdown for anyone interested in clarifying the confusion. For me it was particularly interesting because I am exploring Eat Right 4 Your Type. For me as a type O, Sweet Potatoes are beneficial and Yams are Neutral. 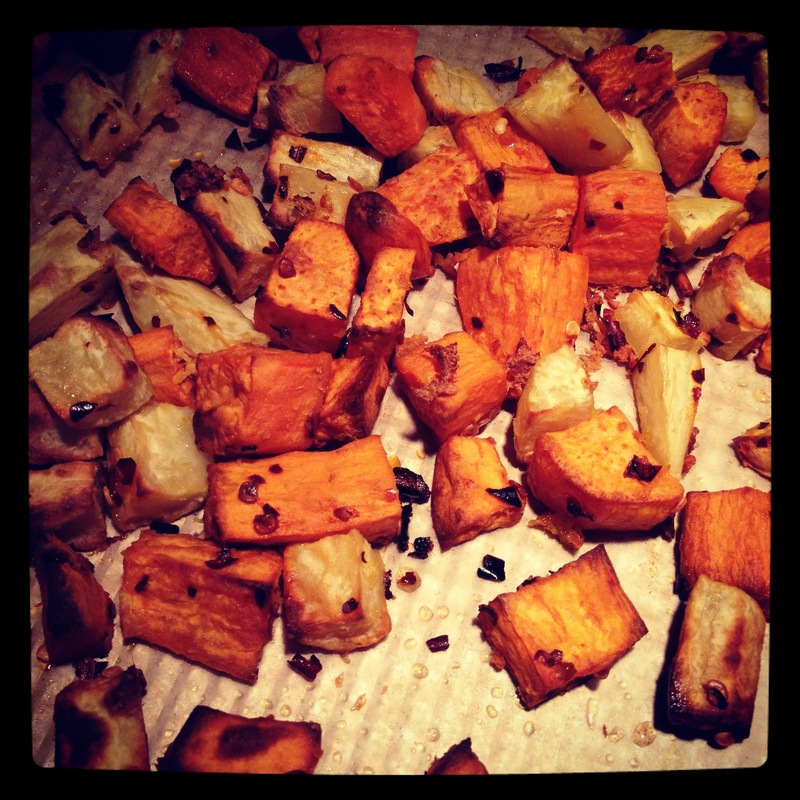 Turns out, the Yams I thought I was eating are actually ALL sweet potatoes (Yay! ), but are labeled as Yams at the grocery store. It all kind of makes my head swim though. UPDATE: Recently, I got the results from the Secretor Test. Turns out I am a Non-Secretor, which means that both Yams and Sweet Potatoes are neutral for me. I’ll still keep eating them, but maybe not quite as often! Anyhow, this recipe has become quite a staple. I love it! And now that I’ve made it so often, I can whip off a batch in no time. Sadly, it disappears just as quickly. The kids will sample it from time to time when they are feeling adventurous, but mostly it’s a dish that my husband and I eat. 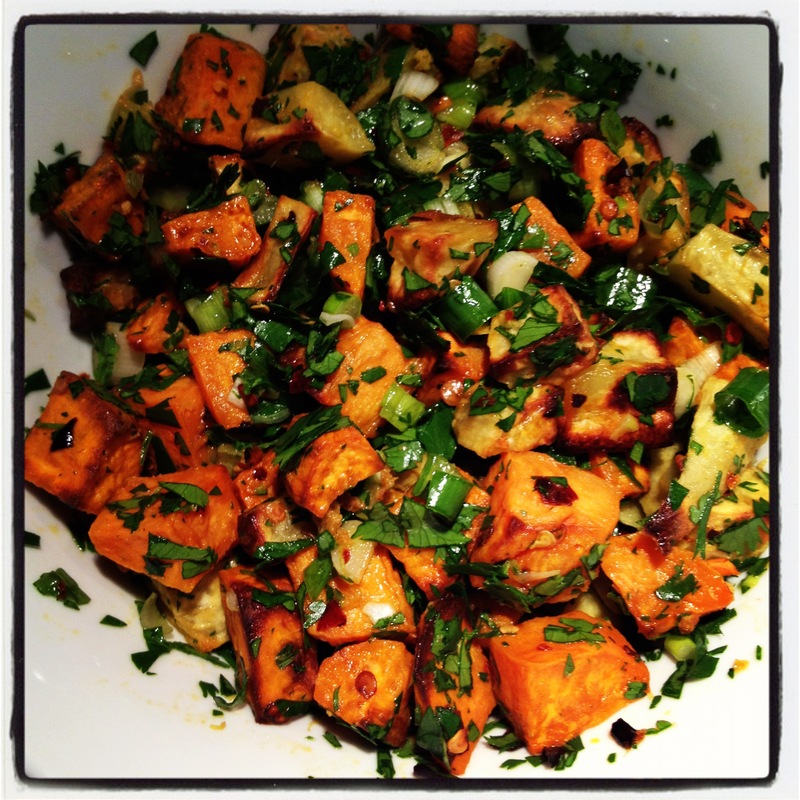 Lucky for my husband, who is an AB – Secretor, both Yams and Sweet Potatoes are beneficial. It’s good cold, but outstanding when served warmed up – which brings out all the flavours. 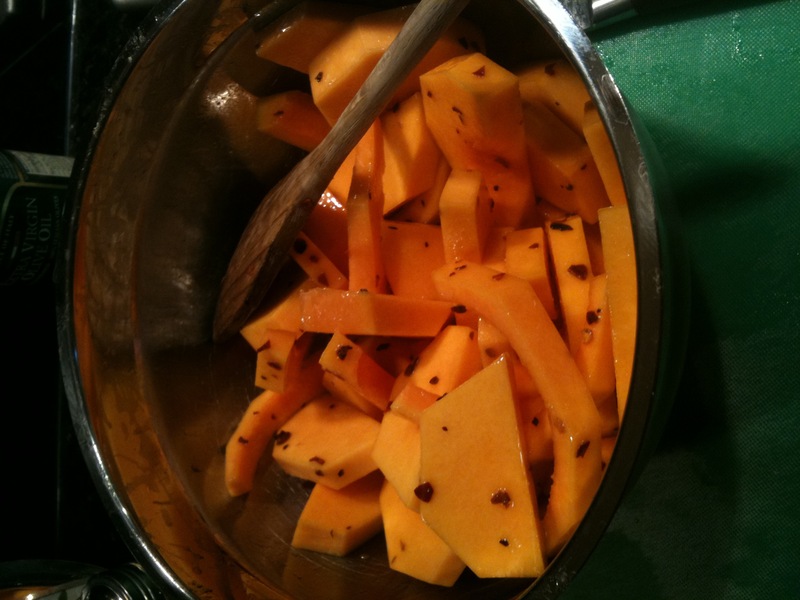 Wash, peel and cut sweet potatoes and squash into desired shapes and sizes. Enough for two cookie sheets or more for batches. Place in large mixing bowl. Add approximately 2 TBSP. Extra Virgin Olive Oil (I usually just make a splash with it into the bowl). Peel & grate, 1-2 inches of fresh ginger. 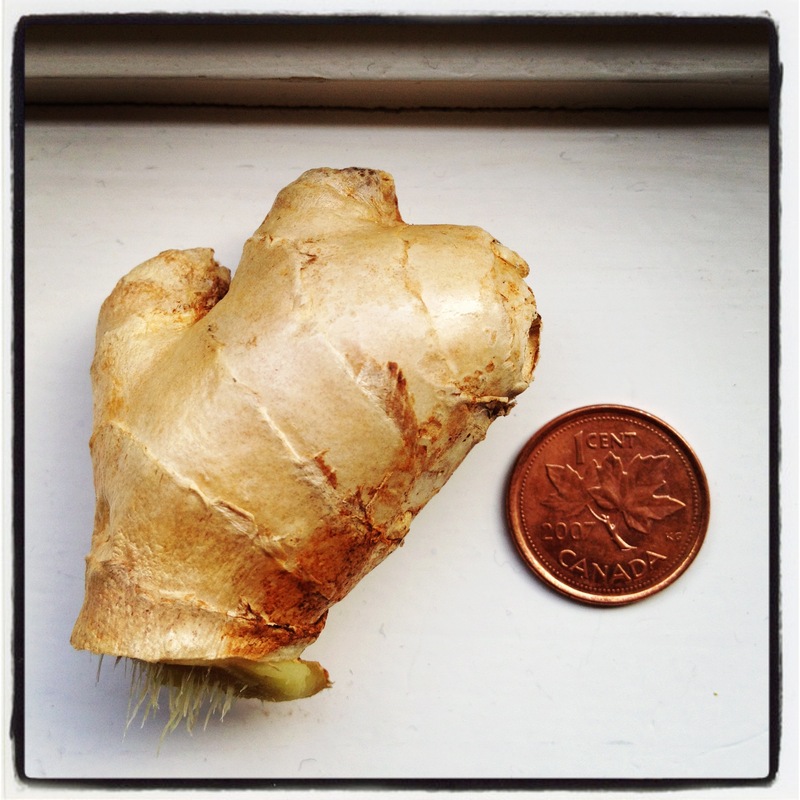 I use a spoon to peel the ginger. It works much better than a vegetable peeler. Add approximately 1 TBSP. of Dried Red Chili Pepper Flakes to the mixing bowl. Here is a picture showing 1 tsp. 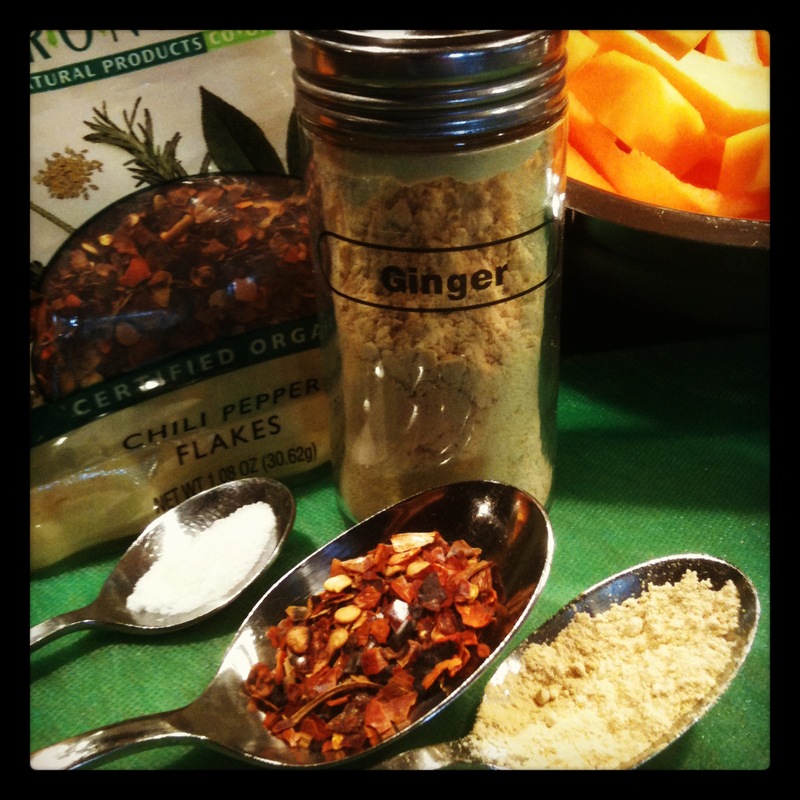 dried ginger, less than 1 TBSP. chili flakes and a 1/2 tsp. ground Himalayan Salt. However, of late I’ve not been adding any salt. Stir to combine and coat the vegetables. Transfer to parchment lined cookie sheets. Place into pre-heated oven for 30 minutes (depending on oven). Check periodically. I find that the sweet potatoes need 10 additional minutes for a nice roasted appearance. For the squash, I usually roast them 20 additional minutes (but turn them over when I take the sweet potatoes out of the oven), to achieve the same roasted appearance on both sides. Once the vegetables have been removed from the oven I allow them to cool slightly before returning them to the mixing bowl. 1. Separated 1 Cups worth of cilantro leaves from their stems and chopped them. 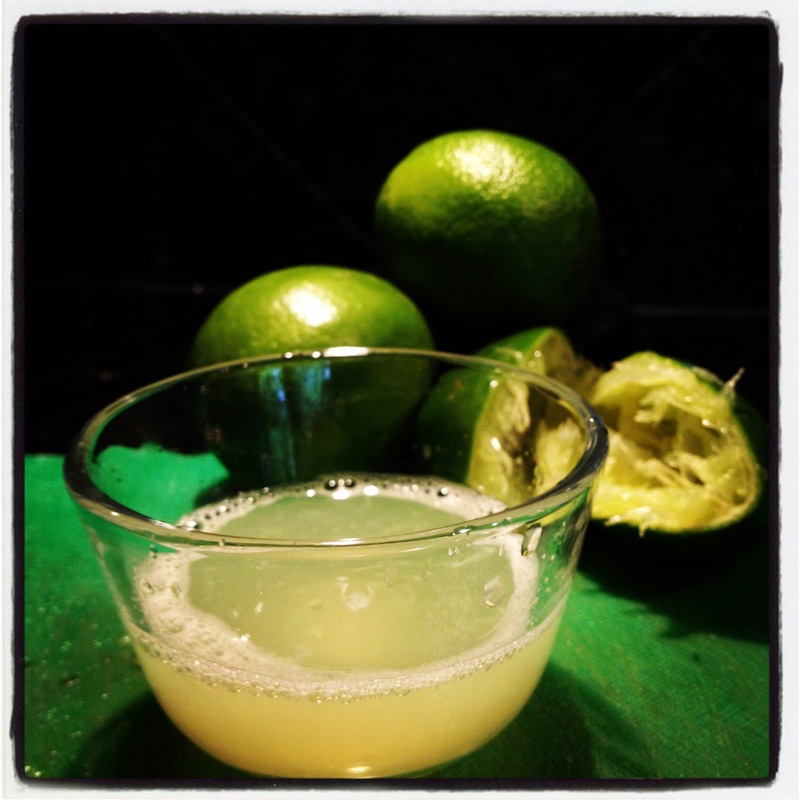 Note: I usually only add the juice from one lime and see how it tastes. It’s easy enough to add more the next day. I’ve made the mistake of adding too much lime juice and regretting it, but easy enough to remedy by adding more roasted vegetables. Also, I’ve noticed that not all limes are juicy, so I always buy 4 or 5 limes at a time. A few times I’ve cut open limes and though they ‘feel’ perfectly juicy from the outside, they are completely dry; it’s disappointing when you need them right then and there. Depending on how things look I may add a splash of Extra Virgin Olive Oil to the bowl and mix it with the lime juice, cilantro and scallions. Then I toss in the Roasted Vegetables and gently combine to coat the vegetables well. I then cover the bowl or transfer to a food storage container and refrigerate overnight or for a few hours. Dedicated to my friend V, whose husband isn’t fond of cilantro, but he gave the dish a try when they visited us last month – and he said he liked it. So maybe for all those averse to cilantro, give this recipe a try…(? ).